Hydrangeas are beautiful landscaping plants with big, delicate blooms. 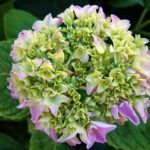 Although these plants are easy to care for once they’re established, droopy hydrangea plants aren’t uncommon as young plants are coming into their own. If your hydrangeas are drooping, it may be due to environmental problems, or they may simply be a variety that tends to flop a bit. Read on to learn about ways of managing droopy hydrangea plants. Hydrangeas droop for many reasons, but it’s rarely due to illness. When hydrangeas are drooping, they’re often expressing their dislike of local conditions. Too much sun and not enough water lead to wilt; heavy flower loads can cause tender branches to bend until they touch the ground. Even an extra dose of fertilizer may contribute to droopy hydrangea plants. Correcting the problem will require extra attention to your hydrangea’s care. You’ll have to play detective to figure out what’s wrong with your plant before attempting to correct the conditions that led to the initial droop. A soil test and some close observation may be all it takes to determine the source of the problem. The combination of too much sun and not enough water is a common cause of hydrangea droop, making it a great place to start when your plants are feeling unwell. Check the moisture level of your hydrangea at a point 1 to 2 inches below the surface of the soil with your finger. If it feels dry, water deeply, holding the hose around the base of the plant for several minutes. Check the moisture level every few days and water when necessary. If this perks your plant up, add 2 to 4 inches of organic mulch around the base to help trap the soil moisture. On very hot days, it may also pay to provide a temporary sun shade during the hottest part of the afternoon. Over-fertilization may lead to droopy flower heads when excess nitrogen leads to fast, spindly growth. These thin branches don’t have the strength to hold up large hydrangea flowers, so they tend to flop dramatically. In the future, always perform a soil test before fertilizing; many times hydrangeas get plenty of extra nutrients from lawn fertilizer run-off. If nitrogen is high, it may help to fertilize with phosphorus and potassium so your plant grows more evenly. Randomly floppy hydrangeas varieties aren’t an uncommon phenomenon. Sometimes, they just flop because they’ve got heavy flowers or they’ve been beaten hard by the weather. 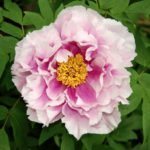 If it’s a yearly problem, try thinning the inside of your plant to promote more robust growth, as well as removing about half the flower buds early in the season. If this still isn’t enough, staking with peony supports or tying the central supports of your hydrangea to a sturdy metal stake or fence post may help it appear more upright.